A green chalcedony with splashes of bright red. 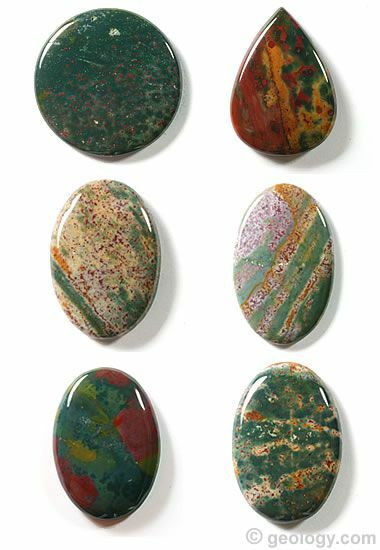 Bloodstone cabochons: Several cabochons cut from material that could be called "bloodstone." The cab at the top left is the best fit for the bloodstone definition. It has splatters of "blood" that are less than "most desirable." The top right stone and the bottom left stone are also good examples of bloodstone. 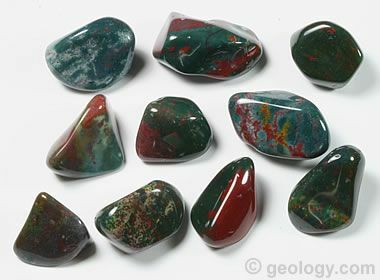 The other three stones in the image could be easily called bloodstone or "fancy jaspers." All of these cabochons were cut from material mined in India. Bloodstone is a dark green variety of chalcedony adorned with a splatter of bright red. It has been a popular gemstone for at least two thousand years. It is sometimes referred to as "heliotrope" by European authors and in works of the 18th century and earlier. As a member of the chalcedony family, bloodstone is a cryptocrystalline quartz. It inherits from that a conchoidal fracture and a hardness of approximately 7 on the Mohs hardness scale. However, the hardness of bloodstone is usually slightly lower, at about 6.5. The lower hardness and opaque diaphaneity are attributed to included mineral matter of at least several percent on the basis of weight. Tiny inclusions of chlorite, amphibole, and pyroxene are thought to produce the green base colors of bloodstone. The splashes of red are concentrations of iron oxide minerals - most likely hematite. The most highly regarded bloodstone has a solid base color of deep forest green. On top of that is a light splatter of sharply contrasting and clearly visible blood-red dots. These are arranged in a spray or a random pattern as if they were blood spatter. Specimens with this preferred color scheme and pattern are rare. Some people relate this color pattern to the "Blood of Christ" and give it a religious significance. That is where the name "bloodstone" and some of the gem's popularity are derived. Color A dark green base color adorned with a splatter of bright red. Uses Gemstone, small sculptures, small utility items such as seals, aphrodisiac. It is unusual to find green chalcedony with markings that are only red in color. Usually there are dots, bands, or streaks of white, yellow, orange, and brown. If these other colors are less abundant than the red markings, the material is still called bloodstone by many people. When colors other than red dominate, either alone or as a group, the material is usually called "fancy jasper." The name "jasper" is used because opaque chalcedony is, by definition, a jasper. 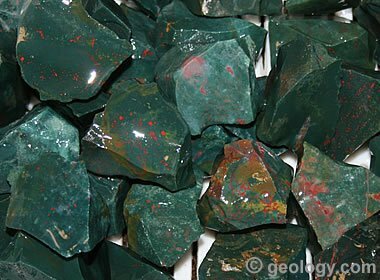 Bloodstone is not called "jasper" because the name "bloodstone" is more specific. Most bloodstone used today is mined and cut in India. Other sources of bloodstone include Australia, Brazil, China, and Madagascar. In the United States, small deposits of bloodstone have been found in California, Nevada, Oregon, and Washington. Bloodstone forms at shallow depths and low temperatures by precipitation from silica-rich groundwaters in fractures and cavities. Bloodstone rough: Rough bloodstone from India with a nice dark green color and a red splatter of blood. This material is in pieces about one inch in size and was sold as a rough for rock tumbling. Top-quality bloodstone is almost always cut into cabochons. Some is also cut into wands, small sculptures, bowls, and other utility objects. Occasionally it is cut into large faceted stones. A large amount of middle to lower grade material is processed in rock tumblers to produce tumbled stones. Bloodstone has historically been a stone of men's jewelry. It was often cut with a signet design, mounted into a ring, and used to seal documents and letters. Today, flat-top or gently domed cabochons are popular in men’s rings and cufflinks. It is sometimes cut in relief or intaglio with the bust of a warrior, a dragon, family crest, national symbol, or other motif. Tumbled bloodstone: Tumbled stones made from bloodstone using a rock tumbler. These stones are about 3/4 inch in maximum dimension. In India, specimens of bloodstone with the finest colors are crushed, ground into a powder, and used as an aphrodisiac. This use removes much of the best bloodstone from the gem and jewelry market. The price for a gram of aphrodisiac rough is higher than the price for a gram of cutting rough. Bloodstone as a "Healing Stone"
For at least two thousand years, many people have believed that bloodstone has "healing and protective properties" that are beneficial to people who own it, wear it, or carry it on their person. It has been thought to control bleeding and inflammation, among other things. For these reasons many people wear bloodstone rings or pendants as a talisman. Within the past few decades, these beliefs have seen a revival in the United States as part of the New Age movement. There is no scientific or medical evidence that these beliefs have any medical value beyond the placebo effect.